Tillmouth Park is a privately owned country house built in the Victorian Gothic style as a private family home. Nowadays, with its own individual style and grace, Tillmouth Park offers a peaceful retreat from a busy life. The Scots destroyed Twizel Castle, a medieval castle, in 1496 in support of Perkin Warbeck. Thereafter, the Carr family who owned the nearby estate at Ford Castle, 11km to the south east, owned the Tillmouth property. On the marriage of Elizabeth Carr to Sir Francis Blake (1638-1718) MP for Berwick upon Tweed in 1689 and the 1690s, the Tillmouth property came into the Blake family. Having no son, the property then passed to his grandson, Sir Francis Blake (1708-1780) first Bt., a mathematician and supporter of the Whig government during the 1745 Jacobite rebellion. He died at Tillmouth in 1780, which would imply a family residence at the property, probably at Tillmouth Park House. Sir Francis Blake (1738?-1818) second Bt., a political writer, commissioned James Nisbet of Kelso (d.1781) to incorporate the medieval ruin into a new Gothick house at Twizel Castle. At the same time, Nisbet was employed by Blake’s kinsman, Sir John Hussey Delaval, first Lord Delaval, at nearby Ford Castle. ‘Twizel was a fantastic Gothick building in a romantic situation on the Tweed: it was never finished and is now a ruin.’. 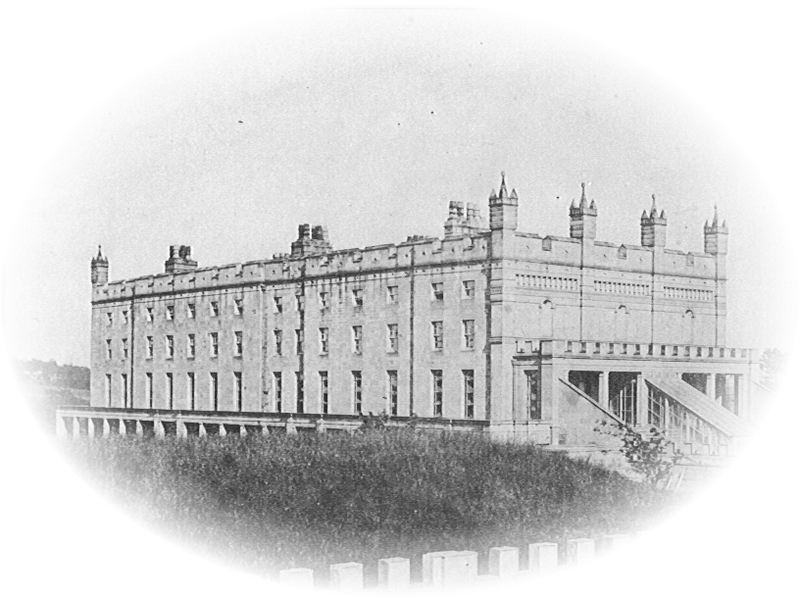 It is said variously that it was never completed and also that it was completed c1830! Building continued at Twizel Castle for some fifty years, work including elements of a landscape layout to complement the Gothick castle. The second Baronet was succeeded by his eldest son, also Francis (1775-1860), who represented Berwick in several Parliaments, until defeated in 1835. He was a colonel in the army and the Northumberland regiment of the Fencible Infantry, and owned an estate in the West Indies. The family lived in Tillmouth Park House, a mansion of c1810, on the opposite banks of the Tweed from Twizel Castle. Gardens were laid out, to the north and south west of the mansion and included a series of pleasure grounds. Following a fire, Tillmouth Park House was rebuilt and completed in 1882 to designs by Charles Barry junior, son of the architect of the houses of Parliament in Westminster and stones from Twizel Castle were used in its construction. It was built for Sir Frances Blake. The Blakes are traditionally descendants from King Arthur’s Knights of the Round Table and the celebrated Admiral Robert Blake was an ancestor. There was a bridge started across the river Till but was never completed. This was called Blake’s Folly. Around the grounds of Tillmouth Estate, there are some of the original features from 1810 including the bridge and the tunnel, which we believe were points of interest whilst out on carriage rides. The old Twizel Bridge was built in the 15th century and troops marched over it on their way to the Battle of Flodden on 9th September 1513.